Class 8 sales in October reached the highest point in more than three years as a smoother supply chain and the bullish economy lifted the total to 25,007, WardsAuto.com reported. Sales improved 39.5% compared with the 2017 period. They reached the highest level since 25,369 in June 2015. Year-to-date, sales hit 203,206, up 33.3% compared with 152,409 a year earlier. With demand for freight hauling strong, analysts were looking for the sales gains. “The market is playing catch-up to the supply chain issues that hit earlier in the year and starting to catch up with the big demand for new trucks in the market,” said Don Ake, vice president of commercial vehicles at research firm FTR. Earlier, trucks were slow to be built — as enough parts were not immediately available — and slow to be delivered in the midst of a driver shortage, he said. But new trucks are hitting the road now. “Sales are largely doing what they are expected to be doing at this point in time,” ACT Research Co. Vice President Steve Tam said. October’s volume includes strong gains at Navistar Inc., whose fiscal year ends in October, he said. “So there is generally a pretty good pop there. If [the industry] adds another 50,000 it will put us at the mark we are expecting for 2018,” with U.S. retail sales, Tam said. Navistar’s International brand notched 4,806 sales, good for a 19.2% share, and a 71.6% increase in sales from the 2017 period. 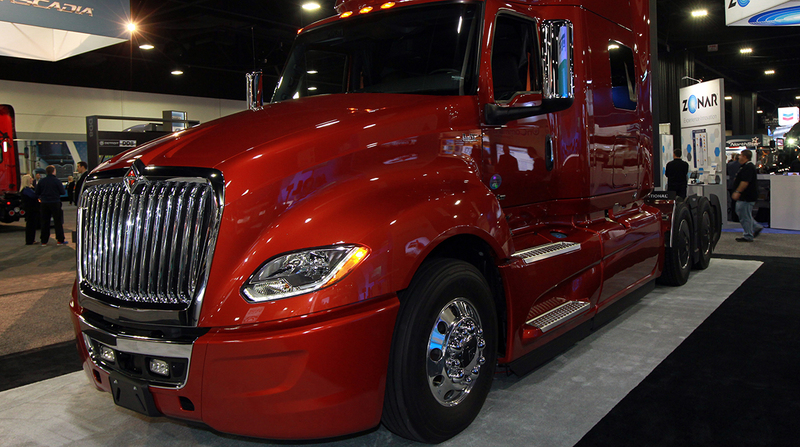 “We were pretty strong at the end of our fiscal year on the fleet side,” said Steve Gilligan, Navistar’s vice president of product and vocational marketing. “We are not seeing any signs of a hard landing [to the current cycle],” he said, adding its dealer stock is up, and dealers are clamoring for more trucks to sell. Freightliner, a unit of Daimler Trucks North America, sold 8,878 trucks, earning a leading 35.5% market share, as sales increased 40.2% from a year earlier. “We all talk about market share in increments of one-tenth of a share, so it’s definitely a fight,” DTNA President Roger Nielsen said at a recent media roundtable. As the industry reaches its production capacity, customers have had to make different choices in the interim as they balance their needs with what a particular truck maker’s capacity might be, he said. “What we are seeing now is supply chain hiccups, not customers abandoning a brand for another,” Nielsen said. The previous record for North American Class 8 production was slightly above 375,000, in 2006, said Tam. Now, with the labor constraints truck makers face, the top is closer to 350,000, he added. ACT’s production forecast is 319,000 this year and 335,000 next year. The company’s share in Canada through September was 13.9%, compared with 10.2% in the year-earlier period, Voorhoeve said, and year-to-date share in the United States through October was 10.6%, according to Ward’s. VTNA had U.S. retail sales of 2,215 in October, earning an 8.9% share as sales jumped 47.7% from a year earlier. Mack Trucks earned a 5.6% share with 1,403 units, a 32% improvement in sales compared with a year earlier. VTNA and Mack are brands of Gothenburg, Sweden-based AB Volvo. At the same time, Peterbilt Motors Co. earned a 14.8% market share on sales of 3,707, up 20.5% compared with a year earlier. Kenworth Truck Co. had a 14.1% share on a volume of 3,526, up 27.3% from the same month in 2017. Backlogs and the business conditions are very good, Paccar CEO Ron Armstrong said during the company’s latest earnings call. “Our Tier 1 suppliers are investing in additional capacity and working closely with Tier 2 suppliers to meet Paccar factory delivery requirements. We expect this situation to normalize in the near term,” Armstrong said. DTNA’s Western Star brand sold 472 trucks, good for a 1.9% share, as sales rose 26.5% compared with a year earlier. “We see, with the increasing investment in infrastructure around the country, there is a lot of room for growth on our side in the vocational segment — these traditional severe-service, heavy-duty applications. You’ll see us go after those with additional features on Western Star,” Nielsen said without elaborating.